A Tour Guide on Tour: "The World's Longest Gallery"
Israel’s Separation Barrier reminded me of the Berlin Wall–pumped up and on a bender. I could see the barrier that divides Israel from the West Bank all over the place. It meanders like a river, forming oxbows around Palestinian villages; sometimes it even goes in circles. On my maps, it actually showed up, but not always following the Green Line. Instead, in some places the wall wandered inside the West Bank, appearing to cartographically incorporate blobs of it into Israel proper. Sometimes the wall just looked like a sound barrier. Most of the time, though, the wall and its panopticon watchtowers ruined for me an otherwise expansive landscape of golden valleys and terraced hillsides. Facing its too, too solid mass made the idea of processes like collaborative placemaking seem like a utopia from another planet. 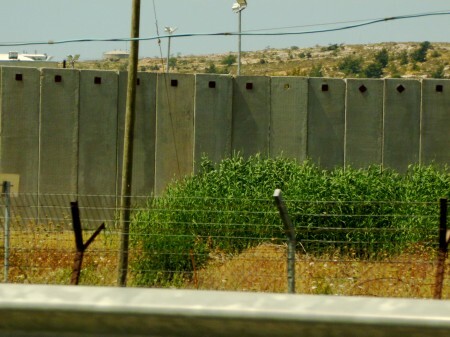 In the little town of Bethlehem the Separation Barrier seemed especially and ironically brutal. 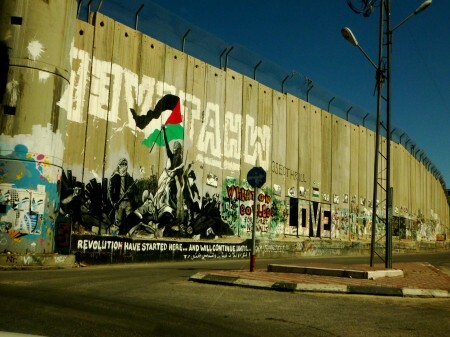 But at the same time, at least on the Palestinian side, it’s a mural support–like a bigger, badder version of Berlin’s Eastside Gallery. International tourists and Palestinians alike have scrawled on it messages of reconciliation and/or resistance. A Banksy shop (“near the checkpoint”) conveniently provides spray paint. 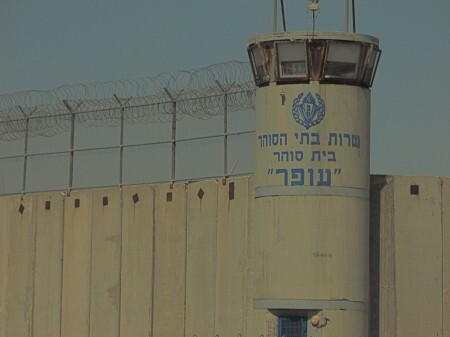 Banksy himself famously visited the Palestinian Territories in 2005 and 2007 leaving his stenciled images on the Separation Barrier where they’ve been recorded, posted, tagged and even removed for resale. I didn’t get a shot of Banksy’s balloon girl, but she’s all over the internet, floating up and possibly over the concrete thing that visually and materially cleaves this potentially liminal space into irreconcilable binaries. These unauthorized images in public (or sort of public) space might be a critique, an effective change agent, or self-serving representations by empowered “internationals.” Do the images speak, I wonder, to the Palestinians penned into one side of the wall, the Israeli soldiers guarding it from the other, or to internationals who can access both sides? Is graffiti subversion or self-expression? Can it change minds, or does it just let off steam? 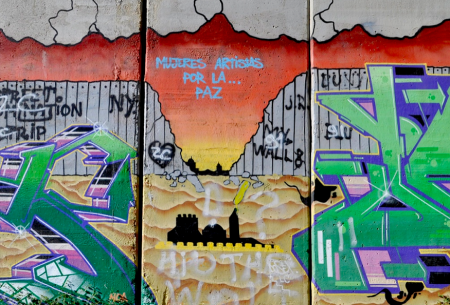 The Separation Barrier is not just an artifact of visual culture, of course. It effectively divides people from people and from places. Yamin, a Palestinian guide, took a group of us to visit a farmer, Abd al Rabbeh, who said the wall is cutting off his farm land from the Al Walaja village where he lives. If he stays in town, he said, he can’t tend his olive trees. But if he neglects them, he loses them. In his village, Palestinians can’t get building permits from the Israeli authorities for their homes but unpermitted homes are demolished. It sounded to me like Catch-22 all over again. Abd seems to receive visitors from everywhere. We signed an already internationally-autographed guest book. We admired his hand-watered garden. We shared hummus. We looked up the hill where bulldozers were kicking up dust, inching across a ridge line, moving closer, I suppose, to surrounding the village. Meanwhile, Abd said that the pigeons can go everywhere. 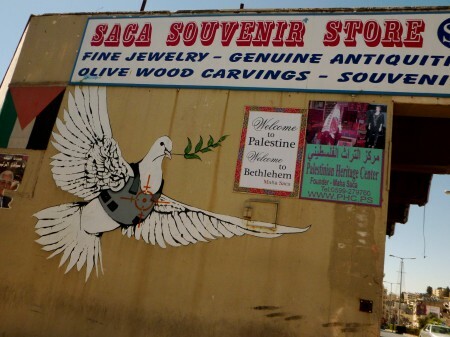 And back in Bethlehem you can buy a newfangled souvenir olive wood nativity scene with a miniature Separation Barrier built right in.